On a wintry February evening, along a narrow road leading to a village nestled in the East Khasi Hills in India’s north-east, some children are playfully running around with branches of dry trees. Smoke hangs in the cold air. Around another winding turn on the road, a fire in the forest comes into sight. A local farmer is burning the undergrowth of the land he owns, employing the traditional slash-and-burn cultivation method. This method, also known as swidden agriculture, is referred to locally as jhum cultivation and has been prevalent across South and South-East Asia for centuries. This fire-fallow farming method helps fix potash in the soil, thereby increasing its fertility. 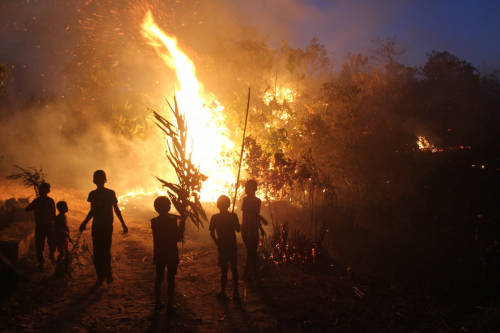 As I stop to watch the fire spread through the forest undergrowth – a spectacular sight – the children come and join me. Only later do I realise that they were not just playing around: they were there as fire-fighters. The fire controlled, the land is spread with ash and dotted with embers emanating smoke. Not too dangerous an activity for children to perform? I ask the farmer. He shrugs, saying that it is normal. The children need to learn the ways of the forest, of preparing the land for cultivation. They need to know how to conserve water in the dry season and deal with turbulent streams in the monsoon, manage fire and be aware of its implications and assess wind directions from an early age. But when I ask about the government’s policy, the farmer points out that this is the only method he knows, and that it has stood the test of time. In 2009, Yale anthropologist and South-East Asian specialist James Scott argued that the “art of not being governed”, has been integral to the South-East Asian upland communities for centuries. Scott wrote that such communities, like those in north-east India, had long managed to remain “ungoverned”, avoid taxes and escape slavery and indentured labour conditions. Under this system, jhum was one of the preferred mechanisms to keep people moving from one part of their hills to another. This allowed such hill communities to skirt land tenure systems and effectively kept governance and the state at bay. Slowly but surely, because of a rise in the demands and pressures of the market economy and greater market connectivity, monoculture – only growing one crop – has become the norm on many plots of land, badly affecting biodiversity. Kolasib in north Mizoram was declared an “oil palm district” in 2014. Monocultures such as rubber and other cash crops have been promoted in the hill areas by various land use schemes of the government over the past decade. James Scott points out that swidden cultivation is on the decline across South and South-East Asia. However, we need to examine the stories of the existence of such fire-fallow methods. Can the slash-and-burn methods continue to exist and prosper, and under what conditions? What would the future hold for such farm practices? The clash between traditional knowledge systems and modern land governance systems could prevent the sharing of knowledge between generations, and the symbiotic link that locals have with their ecology and environment.